Indulge this fantasy for a minute. Young Indians fall in love with a bank (yes, a bank! ), much in the same way that they love Instagram and SnapChat. The bank’s app feels less, well, bank-like, and more like a relatable companion, guiding them clairvoyantly around the pitfalls of missed payments and unnecessary charges, and providing a snappy, friction-free and intuitive experience. Young lovers, being as they are, talk excitedly about this new infatuation, which piques the curiosity of friends and colleagues, who also sign up. “Far cheaper than any marketing campaign,” I muse, with my business hat on. Message to banks: Indians are young and ready for some love. Catch them early, or they’ll dump you for another. Banks may ask, does delighting young consumers with digital services really matter? Isn’t digital simply another channel, applied to business models that have served them well for so long? User-centered disruptions of traditional businesses, from Uber to WhatsApp, provide a clear response. Doing well in digital is the art and science of looking outside-in (“what do consumers want?”), rather than inside-out, (“which parts of our operations can we digitize?”). Most banks have gone digital with the latter approach. Already, a number of Indian fin-tech startups, in areas such as payments and lending, are benefiting from understanding digital consumers more deeply, and are starting to disrupt banking relationships. Overseas, app-based “challenger banks” such as Revolut, Monese and Monzo are eliminating lengthy account opening procedures (“start with a selfie”), adding features such as expense planning based on spending patterns (“your projected balance next month is…”), improving transaction speeds, and using savings from lower cost structures (in-app chat, not branches) to reduce fees and give higher interest rates. Further opportunity—and peril—lies with the large pool of unbanked customers—over 500 million of them. With the expected rise in UPI payments enabling anyone to become a walking ATM, rising smartphone penetration, and the Jio-spurred march to get more people connected, these unbanked customers will find digital banking far more convenient than travelling to a faraway branch or ATM. These large industry shifts distill down to a simple question at the level of the individual consumer: What does he or she want in the digital era? Further, do banks empathize with young consumers, whose service benchmarks are set by the same digital giants—Uber, Facebook, Amazon, Google, Apple and Netflix—as their millennial peers in developed economies? The evidence suggests not. Examples abound of this disconnect. Digital consumers have come of age with the power of Google to search trillions of web pages in an instant. Yet, incredulously, finding a past transaction requires laboriously stepping through transaction histories or each monthly statement. Once located, deciphering the transaction itself is a challenge, with its inscrutable codes and misspelled names. In the age of Instagram, is a scan of the cheque deposited, or, drawing inspiration from e-commerce orders, clear sender or recipient details, too much to expect? Online statements are essentially reproductions of their age-old paper equivalents, and designed for a single customer. In today’s world, these are social documents, used and shared by multiple people—joint account holders, chartered accountants, lending agencies, seekers of KYC and, at times, the income tax department. This vestige is a classic example of being mentally locked into an existing world view, even when designing for a new context. Once banks understand the changing lives of customers, they can start solving real problems for them. Don’t recognize a transaction? Attach an online post-it with a query for your spouse to respond to. 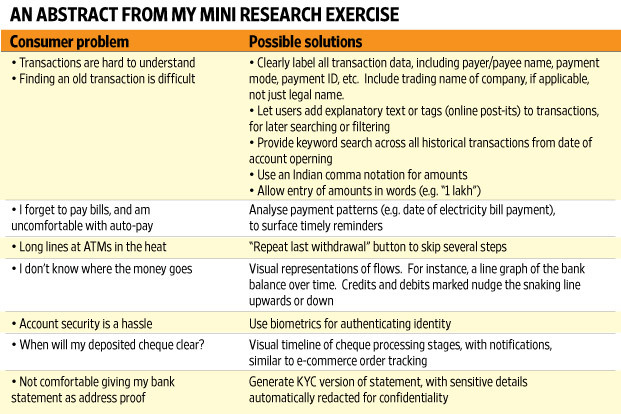 Worried you won’t remember what a transaction is a few months down the road? Tag it with a searchable description (e.g. “life insurance premium for mom”). Customer transaction histories—shopping transactions, utility payments, EMI transfers, and credit card payments —paint a picture of a consumer’s life, adding up to a wealth of behavioural and psychographic data. But few banks are using this data for business and consumer benefit. Loan applications are so old-world. Pre-approved loans or overdraft facilities could be extended at the click of a button, if banks were continuously evaluating credit worthiness based on consumer transactions (only HDFC and, recently, ICICI have ventured here). It’s tempting to continue to subject you to my own clever gyaan. But that would only serve my ego, not get us closer to what consumers actually want. It would also suggest the solution ahead of understanding the problem. So I thought, why not go about this the right way—talk to young consumers, understand the context of their banking and financial lives, and read between the lines to come up with hypotheses for solutions. If you are at a bank, you must ask yourself how often you have conducted a similar exercise, versus chalking the future on an office whiteboard, at a safe distance from consumers. I sat down in conversation with a few young consumers, all of them professionals in their 20s and 30s, married, some of them with young children. A disclaimer applies—this is qualitative research, drawing on a small sample. The bad news first: they are unenthusiastic customers, who came of age in the shadow of the 2008 financial crisis and the looming NPA problem, with Vijay Mallya as its disdained poster child, and harbour suspicions of banks’ motives and competence. Public sector banks were uniformly derided for their digital efforts, with one person describing them as “dinosaurs, stuck in time”. On the positive side, they appreciate the convenience of online banking versus the now-rare visit to a branch, described as “tedious” and “a waste of time”. But online banking is considered nowhere near as convenient as an Uber or a Paytm. No bank’s digital presence rises above the level of basic hygiene to stand out from the pack. These examples only scratch the surface of the possibilities. If you are at a bank, you may wonder where to start the journey of consumer understanding. Start anywhere, but get started. The easiest place is your own young employees, who can provide terrific insights, but are not finding a voice in your own organization. Young Indians are ready for a new kind of relationship with a bank—one that is deeply empathetic, is digitally enabled, and as convenient as calling an Uber. If banks don’t transform themselves, these young consumers will move onto the next digital challenger, without a thought to the incumbents’ impressive networks of branches that they never visit. Nish Bhutani runs an education and consulting company specializing in digital strategies and transformation. His fortnightly column in the Mint on Sunday, Digit Spinner, addresses the digital capabilities of consumer businesses. Read previous columns here.